Welcome To It’s Parti Time For Yorkies! It’s Parti Time For Yorkies is now located in Addy, Washington. I consider my Yorkies to be my family. All my dogs are spoiled with treats, toys and lots of attention and love. My darling AKC Parti Colored Yorkies come from reputable breeders, and are known for their good temperaments, soft coats and small size. They all come from champion bloodlines, and are bred strictly for quality, good health and sweet dispositions. Parti, or tricolored Yorkies, have existed as long as the traditional colored, but were considered substandard by the “show Yorkie breeders” and ultimately rejected. I appreciate these beautiful dogs for their unique color and coats, and I know that you will too! My puppies are fed only the highest quality puppy food on the market, and are given the best chews and treats. All of them are healthy, happy and range in size from three to six pounds as full-grown adults. Rest assured all puppies available at Parti Time are well looked after, loved and registered AKC. They come to you current with vaccinations and they are dewormed from two weeks of age. When adopting or purchasing a puppy from me, you are given a two-year genetic health guarantee, vaccination records, puppy care instructions, as well as food, piddle pads, toys, and AKC registration papers. You are also given a puppy bred and raised with lots of love to bestow on his or her new family. I will always be available to answer any questions or address any concerns you have regarding your new four-legged friend. 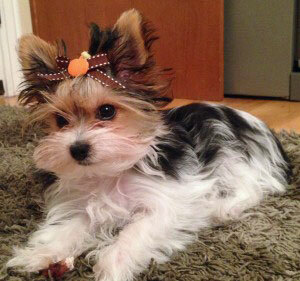 Please browse my site for more information on my Parti Yorkie pups, and reach out today to make an appointment! I am looking forward to meeting you and helping you take in a new furry addition to the family.